It's not only the ingredients that have been updated, the bottle has too. Previously, the bottle housed two separate vials (one lipid based, one hydric based), however this updated version contains two interlocking vials. Also, the lid over the pump can be switched to allow you to dispense with a small or large amount of product, which prevents waste - always important when it comes to pricey skincare. Now on to the product itself. There is a lot of science behind the formulation of this serum so I am going to do my best to explain it to you in non-scientific terms. Skin cells have their own language, through which they express and hear messages, which is known as cellular communication. Cells that communicate well produce elements, which support the 5 vital functions of the skin: regeneration, oxygenation, nutrition, hydration and protection. Ageing and environmental aggressions cause the cells to communicate in a less than optimum way and the result is wrinkles, dull skin, sagging etc. 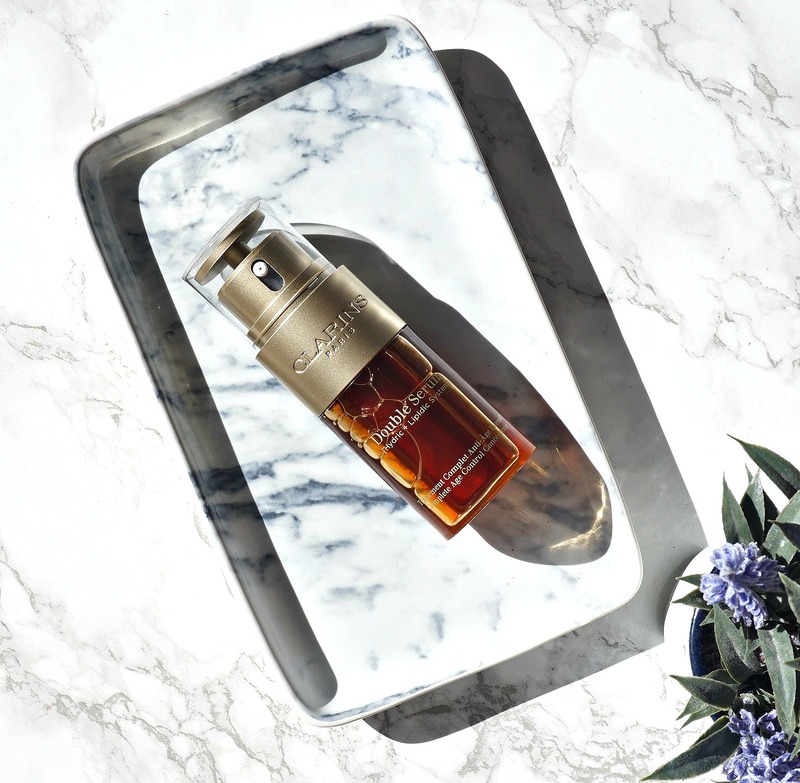 The previous Clarins Double Serum stimulated the expression of the cells but the new version also stimulates the hearing of the cells, thus improving the communication between the cells and improving the efficacy of the skin cells. Double Serum is formulated with 21 potent plant ingredients - 20 of which stimulate the expression of the cells (quinoa, goji berry, kiwi, edelweiss, cocoa tree, avocado and many more) and the 21st is turmeric, which stimulates the listening of the cells. Turmeric is known to have many health benefits including reducing inflammation and the oxygenation and regeneration of cells. The combination of all 21 extracts boost the 5 vital functions of the skin. It is also worth mentioning that this updated version does not contain any mineral oil so it will be suitable even for those with sensitive skin. The serum itself has a very silky texture, but not greasy and it absorbs quickly into the skin. I have noticed that my pores are less visible and my skin feels more supple and firmer since I began using this serum and I have been told that my skin looks fresh, which is always a compliment that I am happy to receive. I am looking forward to seeing further improvements with continued use. Have you tried Double Serum yet? I would love to hear your thoughts on it in the comments below! You can buy it here. It comes in either 30ml or 50ml bottles. All products are bought by me, unless otherwise stated. This serum was kindly sent to me. Opinion is always my own.